Discussion in 'DIY' started by highflyin9, Apr 22, 2018. Apart from some passive filters for loudspeakers over 20 years ago I've never done any soldering. Would this be within reach of a total newby? What would be a good but not too expensive soldering iron for a project like this? Also, would it be a better match with my Focal Elear than the Topping A30 I currently use? It looks slightly more complicated than just passive speaker crossover, but certainly a easy DIY project. Easiest is there is no wiring of the transformer since it is board mounted and soldered and there is also no transistor matching (a pain I am dealing with right now). I'd say it is about the same as putting together an O2, maybe slightly more since power, input, and output cables have to be wired in. The rest looks pretty easy. I use the Hakko FX-888 that is temperature controlled that goes for $99. Other non-temp controlled irons go for around $30-$45, but my Hakko warms up quickly and is fairly constant. I couldn't live without it. A worthy investment if you are into soldering. The Weller WES51 is also a good popular temp controlled iron. bakker_be and AllanMarcus like this. A buddy of mine built a couple of these and loaned me one. I've been listening this morning to it and to my Mainline. Damn, the Whammy is really good! There is certain solid state hardness to the vocals, which is just the opposite of the slight softness to the vocals on the Mainline, but it's tiny (to me). Maybe just a tiny bit more emotion comes through on the Mainline (man, that's hard to describe), but the Whammy is very impressive. On some songs I cannot tell the difference between the amps. On some songs I cannot identify it, but I prefer the Mainline. rtaylor76 and Cspirou like this. Went through the guide and looks like you will have to provide and drill your own chassis, so not exactly completely user friendly for someone without a multimeter and the needed tools in addition to a soldering iron. If you already have all the tools you will need and the time why not give it a go. well I pulled the trigger! I ordered the same case as @highflyin9 and the parts kit. I'll build it stock then play with stuff. More fun! msommers, philipmorgan, dubharmonic and 1 other person like this. Woohoo! PSU built and voltages are great (17.1V)! Too cold in the garage (even with a space heater) to continue tonight, but tomorrow I should get the rest of the board done. Fitting to the case has been to biggest issue so far. I haven't cut any holes in the front or rear of the case yet. Lots of moving things around to see what might fit well. I think the hardest part will be to get it all to line up nicely. Walderstorn, rtaylor76, FlySweep and 2 others like this. I believe I will get to use my Dremel to cut out some of the holes in the enclosure. I like using the Dremel. Yikes, it’s football day tomorrow. Competing priorities! Sigh, just bought the PCB and parts. 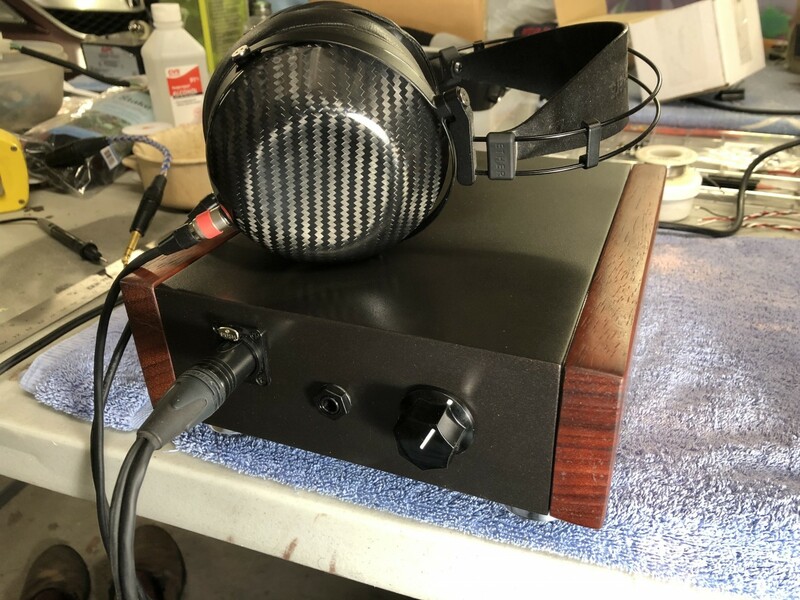 I haven't built an amp since a Bottlehead S.E.X. and a couple O2s back in the day. I blame @Mr.Sneis for letting me know about the free DIY stuff in Chicago, and now my addiction is back. Holy crap, this thing sounds good! Just have my phone hooked up as a source and I am noticing stuff I don't remember hearing as prominently from my Vali2/Modi Multibit stack. Once it is cased up properly, I will do some more comparisons. Thanks for bringing this amp to my attention! All in for about $150, this is superb. FlySweep, JK47 and Riotvan like this. I ordered the parts a few months ago and promptly turned it to my friend for the assembly. Due to the chassis constraints, there is no power switch. Fortunately, I don't obsess about appearance. I have attached a few photos of the build. I've used the standard BOM recommended in the diy writeup link provided on page 1. The opamp used is the LM 833 and I will try the AD823 later. Now, I'm playing this through a balanced preamp that converts balanced to SE as well (apologies to @Psalmanazar). The DAC is the Convert-2 (which is better than sliced bread and I make no apologies ). I have the preamp turned to full volume while the volume knob on the amp itself is between 8-9 am. The HP I am using currently is the Focal Clear but I've used the HD 600 and, infrequently, my LCD 2.2 (change of pace). 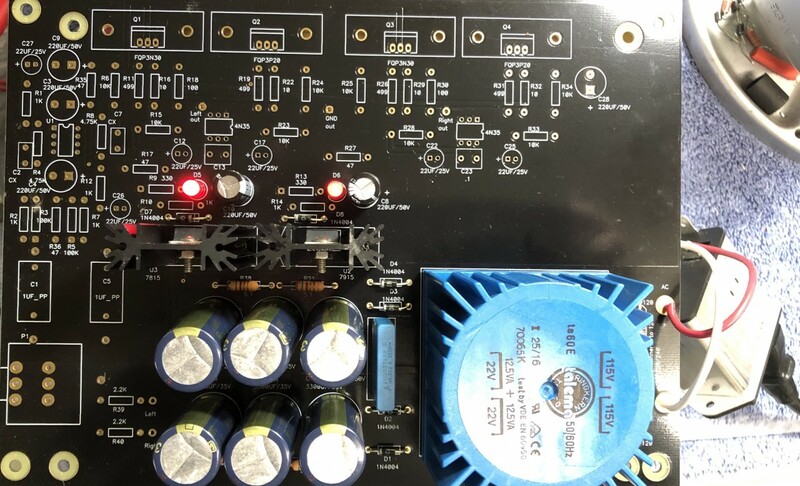 This amp has no issues with driving the different HPs effortlessly. The sound is neutral for the most part but I do detect a hint of darkness especially on the 600. Not sure whether this has to do with impedance since I hear even less of this darkness with the Clear (or the opamp). Anyway, the amp really hits hard on the low end when the recording calls for it. as an aside, it is fun correlating this with the digital meters on the Convert 2. Need to do more listening. haywood, msommers, Jerry and 10 others like this. I finished my amp tonight. It came out pretty nice. I learned a lot about how to work with boards and enclosures. I made some mistakes, buy ultimately, it works. Oddly enough, when I use an aluminum knob, when there is no input and I touch the knob, I get AM radio. Bonus! I solved that issue with a plastic knob. At any rate, I'm gonna live with this one for a while, then probably build another. LetMeBeFrank, haywood, fraggler and 10 others like this. Did you ground the chassis? Yes, but I didn't explicitly ground the pot. Some folks on DIYAudio are suggesting one do that. I switched out my Nobsound passive preamp and put in the Khozmo balanced pre. The hint of darkness I had mentioned previously with the HD 600 is gone. Add: more play on the amp volume now. Got mine cased up and into the system. Luckily, no hum, AM stations, or any other noise when touching various parts of the chassis. Cutting out the giant IEC socket with fuse and switch was a nightmare of drilling holes, burning out my Dremel motor, and using a hand file to get everything to fit. I am not doing that again until either my CNC machine ever gets finished (need a workshop) or I spring for some FPE plates. I don't really like the layout of the board with the volume to the side, as I think it would look better centered. The Hammond case has zero wiggle room so, nothing I could do this time around. I like this amp enough that I might recase it in a manner that I actually like. The wooden sides were an attempt from a couple years go to make the Hammond case look classier. I didn't succeed, but it does look different. I love the big aluminum knob, but I painted it poorly a couple years back as well. At any rate, it felt really good to get back to DIY. I am using the Vishay IRF610PBF / IRF9610PBF and RC4580 opamp since those were a recommended pairing. I haven't rolled any opamps yet, but might not for a while since I am really digging how this sounds. Most of the build is what is listed in the kit/BOM from the DIYaudio thread, though I used the slightly lower powered surplus sealed toroid since I wanted this running cooler and quieter. I did use a switched jack in conjunction with another set of RCA jacks at the back so I could use this as a preamp that would mute when the headphones were plugged it. Works well, though there is temporary shorting when I plug in or remove the headphone plug. In the future build, I might move to a 4-pin XLR and have a proper switch for the preamp. To my budget-fi ears, this sounds wonderful. In comparison to my Vali 2, it hits much harder, with a full bottom that still has nuance and control. I am getting a real amount more detail coming through as well. This gives me the sense of space and layers that I have been wanting, and have missed since I got rid of my Valhalla 2 a while ago. I am still getting a grip on the sound since I don't normally analyze things, but so far, I couldn't ask for much better for the money invested. If someone has an itch to get into DIY, this is a highly recommended project. Super high quality PCB, easy to get parts, customizable sound, and an almost foolproof build. Most annoying part is the chassis work. dBel84, Luckbad, LetMeBeFrank and 7 others like this. Well, I can’t help myself. I oredered anew chassis from aliexpress and will order all the parts when I get back home later this week. Here’s the case I ordered. It should have plenty of room. Gonna get the 15v transformer rather than the 22 as Wayne actually recommended it. He said he only used the 22 since that what was on hand when he built the amp. fraggler and Luckbad like this. Going back and forth between the WHAMMY and the Vali 2, the WHAMMY definitely is giving me more details and realism. For some recordings, I swear I can actually see the artist in front of the microphone. However, the mids (voices) do seem relatively recessed in the mix. On some songs this leads to being overwhelmed by the instruments when trying to get into the voices. The Vali 2 definitely presents voices more prominently, with the rest of the music a little further away. While this is what I am used to and prefer for some music, there is a veil for lack of a better word that keeps me just a little further away. This makes me more curious than before about trying different opamps to see what happens. Jerry and FlySweep like this.